Like your bathroom cabinet or kitchen pantry, your wardrobe says a lot about you. We’re not just talking about the stories behind the items hanging in it—the way you choose to organise and display clothes and accessories is just as telling about your personality. (Type-A people, we’re looking at you.) Do you hang items by style and colour, or haphazardly layer jackets on bent wire hangers from the dry cleaner? Are your favourite accessories on display and easy to access, or stowed in the back of drawers under layers of tangled accessories? As we begin to transition our homes and wardrobes to winter, the addition of bulky coats, knits and cold-climate accessories can wreak havoc on a well-organised space. If you’re ready to unpack your winter wares, take note. 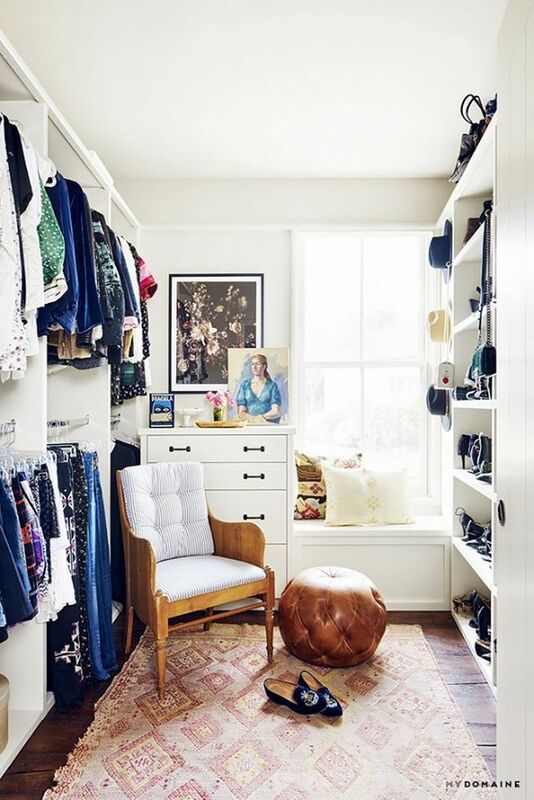 We turned to Khloé Kardashian’s wardrobe designer, Lisa Adams of LA Closet Design, and leading fashion bloggers to find out the insider tips they swear by to keep an organised, Pinterest-worthy wardrobe. Yes, there is a right way to fold your sweaters, and no, you’re probably not making the most of every inch of storage space, according to Adams. The best-organised wardrobes aren’t fiddly or overly styled—they’re designed to suit the owner’s storage habits, whether good or bad. For example, if you don’t have time to fold certain items, open shelving displays will be hard to keep tidy long-term. Instead, consider your organisation habits and arrange your wardrobe accordingly. Alicia Lund, the blogger behind Cheetah Is the New Black, says she allocates drawers and decorative baskets to toss accessories into rather than worrying about folding and sorting each piece. “I have special baskets and drawers dedicated to the heavier winter items,” she tells MyDomaine. If you struggle with limited hanging space, Adams says there’s one area of the wardrobe you’re likely not utilising: the back. “If you have more depth than width in your wardrobe, I would suggest hanging bulky coats front-to-back on an extended rod,” she says. Winter calls for denim and sweaters, which means you’ll need to dedicate extra space in your wardrobe to folded items. The issue? Folded clothing displayed on exposed shelves can look messy in an instant; rummaging for that knit at the bottom of the pile can leave the rest in disarray. Lund says she avoids this issue by organising them according to a code. “I fold my denim and sweaters, stacking them by wash and colour so I can easily see what I have,” she says. She also notes that inserts will help you maximise every inch of drawer space, including the depth and height, which are often underutilised. “If you have deep drawers, think about two-tiered drawer inserts to maximise the height,” she suggests. Do you ever feel like you have a wardrobe bursting with clothes but nothing to wear? It’s all about how you visually merchandise your wardrobe, according to Style MBA blogger Sara Azani. Her go-to tip to ensure new winter purchases don’t get lost in the abyss of your wardrobe is to use a clothing rail, a noticeably on-the-rise trend we’ve noticed in a lot of stylish bedrooms. “I keep a clothing rail of unworn or new items I have recently purchased which help inspire creativity,” she says. Your wardrobe serves a practical purpose, but as Azani points out, it’s also important to give it the same styling attention you would other parts of your home. After all, it’s the place where you ready yourself for the day ahead. Do you really want to start each morning by fumbling through messy drawers and searching for missing socks? Azani says she buys matching containers to give her wardrobe a uniform look, even when the contents are thrown in. “I purchase small linen storage boxes that you can find at IKEA or CB2, and [I’m] also a big fan of shoe boxes, especially [by the brand] Alaïa, as they’re made of leather and are an effective alternative for storing smaller accessories,” she says. Next up, 12 amazing fashion things you can actually buy on Amazon.